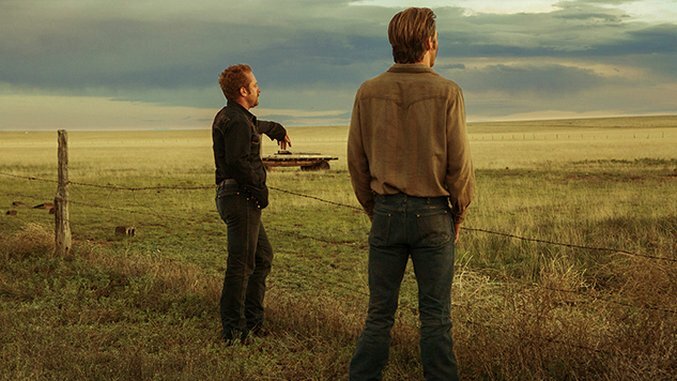 After Forsaken and The Duel, Hell or High Water is the third Western to pop up on movie screens this year (and not the last, with Ti West’s In a Valley of Violence still to come). Though Forsaken never quite transcended its generic trappings, and The Duel perhaps threw in more plot elements than it could ultimately handle, David Mackenzie’s new film gets the balance so right that, after a while, I forgot I was watching a genre film and simply found myself immersed in the lives of these characters. That is a tribute to not only the performances and Mackenzie’s direction, but also to Taylor Sheridan’s screenplay, which finds seemingly boundless amounts of colorful human detail and unexpected humor in what, on the surface, stands as a clichéd narrative. Hell or High Water is essentially a cops-and-robbers tale, with grizzled soon-to-retire veteran sheriff Marcus Hamilton (Jeff Bridges) and his deputy, Alberto Parker (Gil Birmingham), going after a brotherly duo of bank robbers: Toby (Chris Pine) and Tanner (Ben Foster) Howard. Even the Howard brothers initially appear to be standard-issue as far as thieves go, with Tanner being the hot-headed, just-out-of-prison sibling and Toby the more brooding, thoughtful brother angling to get out of the criminal lifestyle. Impressively, none of these characters at all play like walking banalities onscreen. As Marcus, Bridges delivers his lines in a deliberately strained drawl that suggests the inevitable depredations of old age, and yet he’s never heavy-footed in spirit. His Marcus Hamilton may implicitly see a certain kind of mortality in his impending retirement, but he prefers to face this knowledge with an amused twinkle in his eye, noticeable especially in his jokey interactions with Alberto. Even Alberto exudes an authentic inner life, with Gil Birmingham’s pained-yet-tolerant reactions to Bridges’ racist joshing of his character’s Native American heritage implying an intimate familiarity between these two which has built up years before the film’s events. Most crucial to Hell or High Water, however, is the sense of genuine affection one can feel between the Howard brothers, despite how temperamentally different they are. Chris Pine’s and Ben Foster’s performances offer a study of contrasts: Pine is relatively quiet and internal compared to Foster’s showier (though still carefully modulated) live-wire antics, but loyalty and respect still course through these two, as does their genuine affection for one another in the way they occasionally act like children together, playacting as if they had never grown up. Perhaps their still-firm bond was a necessary byproduct of their shared troubled, poverty-filled upbringing, with hints dropped between them of an uncaring mother and a father that Tanner may have angrily shot to death a long time ago. That’s the kind of rich detail with which Sheridan has lavished his screenplay: His characters are so fully imagined that, combined with actors and a director sensitive to the nuances in the script, we ultimately respond to them as flesh-and-blood people. But Sheridan—who tackled the moral difficulties of the drug war with his script for Sicario—has even bigger thematic game in mind. Hell or High Water is also meant to be a topical anti-capitalist lament, being that it takes place in a west Texas that looks to have been decimated by the recent economic recession, with big billboard signs of companies advertising debt relief amid stretches of desolation, and with Toby driven in large part by a desire to break out of what he sees as a cycle of poverty for his loved ones, to provide a better life for his two sons and ex-wife. All of these threads build up to a finale that thankfully goes not for a mindlessly violent showdown, but for a tension-filled dialogue-based confrontation which plays like a meeting of minds between characters who have more sympathy toward each other than they perhaps realized. Even as two of the main characters reach a kind of truce, however, Mackenzie comes up with an even more devastating image with which to end his film: He simply moves the camera from high in the air down to a batch of grass. It’s as if Mackenzie wanted to contextualize these human dramas for us—we all end up in the ground, ultimately. Here, in Hell or High Water, is a sterling example of genre craftsmanship at its intelligent and unexpectedly affecting best. Kenji Fujishima is a freelance film critic, contributing to Slant Magazine, Brooklyn Magazine, The Playlist, The A.V. Club and the Village Voice. He is also Deputy Editor of Movie Mezzanine. When he’s not watching movies and writing and editing film criticism, he’s trying to absorb as much music, art, and literature as possible. He has not infrequently been called a “culture vulture” for that reason.